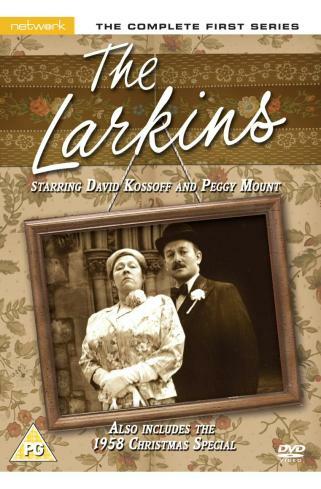 Meet the Larkins - the put-upon but crafty Alf (BAFTA winner David Kossoff), his domineering wife, Ada (Peggy Mount), aimless son Eddie (Shaun O'Riordan), daughter Joyce (Ruth Trouncer) and her American ex-GI husband Jeff (Ronan O'Casey), an unemployable writer of stories for cowboy comic 'The Bullet'. They all live in a state that falls somewhat short of domestic bliss at 66 Sycamore Street, in a suburb of London, next to inquisitive neighbour Hetty (Barbara Mitchell) and her family. This classic early ATV sitcom was created by Clapham-born Fred Robinson and based upon his youthful scripts for plays about a fictional Cockney family; 'people I've seen in my local'. With skilful comic playing from a renowned cast and a script that ATV production controller Bill Ward described as the funniest he had ever read, The Larkins inspired great affection throughout its run between 1958 and 1964. It also gave Peggy Mount her first major television role - the formidable character of Ada Larkin becoming the first in a magnificent line of battleaxes. This complete first series was originally screened in 1958, and includes that year's Christmas Special.